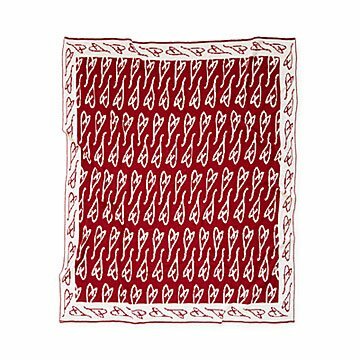 Cozy up to this knit throw featuring a print made from singer Eartha Kitt's handrawn heart. Cause you're my heart's delight"
Legendary singer Eartha Kitt's hand drawn heart takes new life in this super soft reversible throw. Designed by Eartha's daughter, Kitt Shapiro, as a tribute to her mother as both a parent and inspirational figure, it makes the perfect gift for mothers, loved ones, fans of Eartha, or for yourself as a snuggly home addition. Made using recycled materials and designed in New York. Kitt Shapiro, the daughter of legendary entertainer, Eartha Kitt, had an unbreakable bond with her mother. It was in 2008 when Eartha lost her battle with colon cancer, that Kitt founded Simply Eartha, a lifestyle brand that shares her mother’s wisdom, uniqueness and humor. Simply Eartha is a line of unique home décor and gift items that honor Eartha Kitt’s words and writings. Each product is proudly made in the USA, just as Eartha would have wanted. From Eartha and Kitt, to you.